So far Jared Coppola has created 13 blog entries. 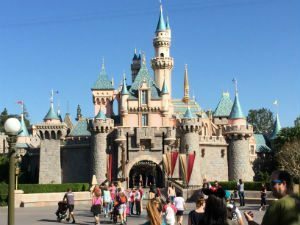 Sophomore Jarred Coppola shares his experiences at the Worldstrides Heritage Festival, including a Disneyland day, March 5-8. The Worldstrides Heritage Music Festival, a yearly event that choir and band students can attend, was certainly a blast, March 5-8. The experience I had in participating in this trip is beyond any other trip I have been on here at FC. The first day that we left for heritage, I didn’t know what to expect. I was a bit frightened that I wouldn’t be included in much, this being because I was one of the youngest high schoolers there. We boarded the bus, and the second I got on, I could feel the excitement in the air. People were jump up and down in their seats, talking non-stop; it seemed like I was in for a great time. I thought that the bus ride would be extremely long, but it proved to be pretty short and fun. I was able to hang out with friends, eat snacks, and overall just have some fun time to sit back and relax. Really enjoyed spending time with my friends throughout this trip, and I feel like I had a lot of time to get to know them all better. As we neared Medieval Times, traffic started to get really bad, so we weren’t able to drop our stuff off at the hotel. This probably the only backfire of the bus ride, and it wasn’t a big deal at all either. Once we arrived at Medieval Times, we walked in the doors and got our crowns, bearing the color of our knight. We then took a picture all together, and went in the building. Inside there was a bar, some shops, and horse stables. The horses there were beautiful, pure breed Spanish horses. It was pretty cool to see them up close before watching do spectacular things in the show. After we looked around a bit, the “Prince” came out and told us the rules, and led us to our seats. We sat down, and were automatically greeted by our server. He was a really kind man, I wish I had brought my wallet to tip him! Anyways, the server brought out drinks for us, and the show began. First, there was the introduction of the knights and the horses. Next, there was a conversation in the royal family. They announced the special guests, which included people on their Honey Moon, people celebrating their birthday and schools/ other groups. The “Queen” asked that the feast begin, and we were brought a huge chunk of chicken. The smell in the air was spectacular, it had everyone’s mouths watering! We started to eat, as the knights started to hold the tournament. First things first, the knights used spears to try to aim at a target. After that, they had a round where the knights tried to hook a ring around a stick while riding a horse at high speed. Next, the knights had a jousting tournament, and fought another night to the death until there was only one left. Our knight, the blue knight actually won! It was really exciting to see the battles. Sparks flew when the swords would clash, there were also maces, axes and slings! By the end of the night, we were pretty tired. My group and I relaxed and watched some TV when we reached the hotel, we also ate some snacks. Then we went to bed, with great anticipation for the fun of the coming day. The next day we woke up and got dressed, and immediately went out of our hotel. We got breakfast and boarded the bus to Disneyland! Everyone was so excited. We couldn’t wait to spend a day at such a fun place! After we arrived, my friends and I were practically skipping in pure joy as we entered the park. The familiar smells of churros, popcorn and many other tasty snacks returned to our senses. We all immediately went on a ride, which was the Radiator Springs Racers, in the new Cars Land ride. We had such a fun time! The line wasn’t too long either considering that it wasn’t a weekend day. As the day passed by we went on many rides and continued to live a day in the “happiest place on earth.” As we walked through the park, we saw many familiar characters, such as Donald, Goofy, Mickey, Minnie and even some other characters, like the Evil Queen from Snow White. I actually ended up taking a picture with the Evil Queen, too! I have to say, I don’t ever remember the cast members at Disneyland that played characters acting so well! When we encountered the Evil Queen, she was pretty sassy, and she said things like, “I would have looked good in a picture even if I wasn’t ready to take a picture,” or, “Move! Move to the side!” She even asked one little girl to bow to her! We ended up eating at the Tomorrow Land fast food restaurant for lunch, and the Plaza Inn for dinner. The food was really good, but it was expensive. As the day came to a close, we heard that Johnny Depp was in the park. But sadly, we didn’t spot him. The voice actor of Anakin Skywalker I the Clone Wars was also there! Night fell, and we started to head back to our meeting place. We met and boarded the bus that headed for our hotel. When we arrived, we hopped in the beds, and started to kick bad for a bit before bed. I popped some popcorn, and we ate a little and got ready for bed. When we woke up the next morning, we headed to the performance venue to start setting up for our performances. I was playing in the jazz band for the trip, because I was selected to go out of my percussion class. I played to congas, Trevor Trevino, ’17, played the bass guitar, Andrew Guthrie, ’15, played the saxophone, and Madison Seib, ’15, played the trumpet as well as Janae Shew, ’20. We thought that our performance hadn’t topped that of the other groups, but the awards ceremony that night proved us absolutely wrong. After the jazz band performed, the ensemble, concert choir and junior high choir preformed. All of them did outstanding performances, and the crowd’s cheers showed major approval. We were able to go to Taco Bell while the choirs were practicing too. When the bus arrived, we all piled on excitedly, eager to take our second trip to Disneyland. When we arrived, we walked through the gates and stepped right into Downtown Disney. I bought a Disney Sketchbook, which compiled of sketches from a lot of the major Disney animators. After that, we went to Disneyland, and went on a few more rides. After we had rode a few more attractions, we headed to the awards ceremony. At the ceremony, the fireworks started to go off, but the loud noise made many people jump! After that we enjoyed the awesome colors and lights of the fireworks before the ceremony began. There was a little show put on before the ceremony, which was exciting. After the awards started, they started to explain the rules and what awards meant what. Then they started to announce the awards. Right off the bat, jazz band was awarded gold! Next, ensemble was also awarded gold, followed by concert choir being awarded silver, and junior high choir awarded bronze! We were practically in awe of the amount of awards we won. After all of this, Guthrie won the “If you wish” award, as well as the maestro award. Senior Ivette Ibara also won the maestro award. After all of this, we expected nothing more. This was it. The overall Heritage Music Festival 2015 trophy was about to be announced. We thought we didn’t stand anywhere close to the bigger schools. But when the announcer announced the winner to be the Fresno Christian Concert Choir, we all stood up, the cast of characters came out, confetti spit out, lights flashed, and we were going crazy! Leslie Banister and Susan Ainley went up onto the stage and claimed the huge trophy. Banister was crying tears of joy! Afterwards, we celebrated. We took pictures, crowded around the trophy chanting and cheering. We even went to get ice cream afterwards to celebrate. When the bus arrived, we were all ready to go home. We were really tired, after all. As the day ended, we felt such a great joy to have gone on this trip. I felt so blessed to be a part of such a cool group of people. I really hope to go again next year, because the experience my friends and I had this year was beyond fun. Big shout out to Leslie Banister and Susan Ainley, this trip has been the best school trip I have ever experienced in my life. Follow The Feather via Twitter @thefeather and Instagram @thefeatheronline. 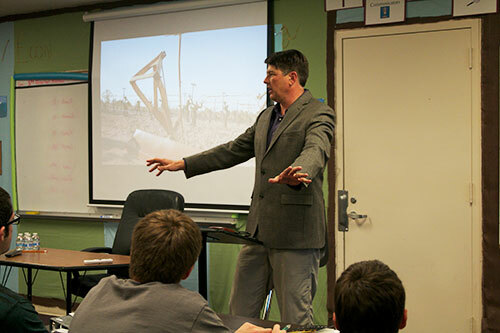 Almond farmer John Nale is one of 12 speakers at this year’s Career Fair, March 11. The FC Career Fair is a yearly event allowing students, especially juniors and seniors, to learn about a variety of different careers. This event has been continued for four years now, and is on March 11. Lled by Academic Advisor Michelle Warkentin, the half day of instruction provides exposure for students to learn about careers that they may be interested in pursuing. Warkentin, having started this event, encourages students to use this opportunity for their future well being. A handful of students are attending, but even though the number is limited, most students think that the fair is beneficial. Nick Fontes, ’15, shares his opinions of the importance of career fair. Follow The Feather via Twitter @thefeather, Instagram @thefeatheronline and Facebook @thefeatheronline. This writer can be reached via Twitter: @Jaredsthename. For more news, read the March 4 article, BRIEF: Choir students to attend Heritage Festival, March 5-8. Vainglory has been featured on the App Store countless times, and was featured during the Keynote Event event in 2014. Vainglory, a game available on Apple devices, is a revolutionary mobile game. The graphics are completely stunning, and the gameplay is simple as can be. Super Evil Megacorp, creators of Vainglory shared some compiled thoughts about the game, including graphic and gameplay details. Vainglory consists of spot on two touch gameplay mechanics, controlling where your character moves, and moves it uses towards something or someone else, making the mechanics similar to popular MMOs. Vainglory has been featured on the App Store countless times, and was featured during the Keynote Event event in 2014. The controls and graphics for this game are stunningly fast. They will keep you playing for hours with and intensity level that is insane. There are a few different game modes including Training, Public Match, Practice and Party. Each of these modes features a third Person combat style, where the player levels up in one match, not through constant gameplay. This mechanic gives players the chance to fight one another without having to constantly level up on their own time. There are currently 13 characters to choose from, each having four special abilities, three of which are unlocked in each match. To win, the player must constantly regenerate health at the spawn, and spend gold to level up as much as possible throughout a match. The first team to claim the enemy’s base is victorious. With fun, intense combat mechanics and graphics appealing to many, Vainglory is a game that will entertain likely anyone. I would rate this game four out of five stars for all of these reasons and more. FThis writer can be reached via Twitter: @errorcode404_usernotfound. For more Featured Apps, read the Feb. 3 article, Featured App: Shades. For more reviews, read the Feb. 11 article, Family friendly movie incorporates emotion, real life. This program, starting with Sister to Sister, has been continued now for over, eight years, and is run by junior high science teacher, Terry Richards and history teacher, Hallie Rojeski. Brother to Brother and Sister to Sister are mentorship programs made specifically to mentor junior highers through an upperclassman. This program, starting with Sister to Sister, has been continued now for over, eight years, and is run by junior high science teacher, Terry Richards and history teacher, Hallie Rojeski. Each share the passion to help counsel these junior highers with people who have been through similar circumstances. The Brother to Brother program is a more recent installment of the two, continuing now for five years. Richards has grown the program through the years by raising money, by collecting recyclables from class rooms. Richards, being the founder of Brother to Brother at FC is responsible for all of the fun engaging activities that occur in Brother to Brother, by collecting bottles and cans to turn in for money on his own time. The school has also put bins in every classroom that are to collect bottles and cans for this very purpose. No money comes from the school, and a select number of luncheons are free. Students in Brother to Brother and Sister to Sister enjoyed their last luncheon with their older brother or sister on Dec. 2, to end the first semester before Christmas Break. Seventh grader Logan Lewis is currently in the Brother to Brother, with older brother Collin Winegarden, ’15. Lewis enjoys the program and looks forward to joining the program next semester. Seventh grader Raffi Mazmanian was also in the program, and will also be joining next year, because of his good experience this semester. 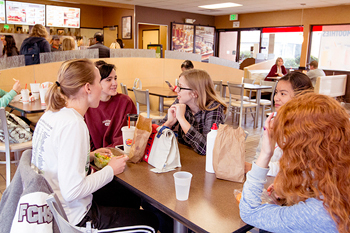 Along with the free luncheons provided, including Panda Express, Taco Bell, students who participate in this activity, whether they be in junior high, an underclassmen or upperclassmen, are the few in the school (other than CJSF, CSF and Seniors) that are allowed at certain times to go off campus for lunch. These events provide a fun bonding time for older brothers or sisters and their corresponding younger brother or sister. Junior Justin Houts, older brother of Mazmanian, enjoyed spending time with the younger brothers as well as older brothers. Winegarden, older brother of Lewis, also enjoys getting to know his younger brother as well going off campus for lunch. While Rojeski is the current advisor of Sister to Sister, the program has been around since 2008. Previous FC teacher including Molly Sargent and Natalie Douty ran the program prior to Rojeski. As the program did close down for a couple of years, Todd Bennett, former Principle, asked Rojeski to start it back up again. This program is also funded by collecting bottles and cans, led by Richards. Sister to Sister also has off campus lunches and free luncheons. Seventh grader Elizabeth Hinshaw, younger sister of Skyler Lee, appreciates getting to know other high schoolers as well as students her own age. Hinshaw’s older sister, Lee, enjoys the time she spends with her younger sister as well as the program as a whole. Sign-ups begin next year for this program. When the time comes around next semester, visit room 629 to sign up for Brother to Brother, and room 628 for Sister to Sister programs. For more features, read the Feb. 11 article, A day in the life of an FC secretary. Follow The Feather via Twitter and Instagram: @thefeather and @thefeatheronlilne. This writer can be reached via Twitter: @skylerklee. Although this game can be frustrating, the gameplay is simple and boasts beauty. It is colorful, appealing to the eye and has a nice minimalist design. 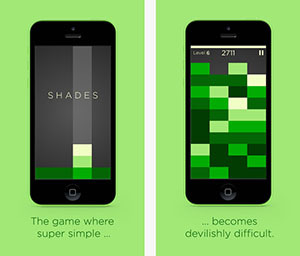 Shades is a game similar to Tetris, but with a twist. This Indie game seems simple enough, but is surprisingly difficult. The game features matching shades of colors, as the name suggests. If you get a whole row of one single color, you cancel out that row. The goal of the game is to last as long as you can without filling the screen with blocks. UOVO, the creators of this app give a perfect description of the game and its complexities. Having played the game, and I know how frustrating it is to mess up when you have gotten far! The main strategy required to do well in the game is to stack the blocks from darkest shade to lightest, and making plans to match rows while doing that. It’s also good to watch which block is coming next by looking at the color strip on the upper-most part of the screen. Although this game can be frustrating, the gameplay is simple and boasts beauty. It is colorful, appealing to the eye and has a nice minimalist design. The sound effects are very soothing as well. They are composed of almost violin-sounding clips. Even the graphics are soothing to the eye! The game has three different modes: Easy, Medium and Hard. The developers warn that it is “Surprisingly difficult”. Another bonus of gameplay is that you can change the colors you want to play with. I would strongly suggest this game. One app review by “@Angelfreak91,” states the following. This app was even made App of the Week by Apple themselves. It was also featured in Apple’s “Best New Games” section. As of Jan. 29, it is 20th on the App Store top charts. If you are looking for a simple relaxing game, this game is for you. Best of all, it’s free. Follow The Feather via Twitter and Instagram: @thefeather and @thefeatheronline. This writer can be reached via Twitter: @jareds_the_name_. For more featured apps, check out Featured app: Elevate. For more features, read the Jan. 26 article, Local eatery hosts school fundraiser (VIDEO). The whole object of the game is to dodge items. However, this time, instead of dodging pipes, the user is avoiding the ground, rocks, and even the clouds. RETRY is a gaming app that will draw users in with addictive gameplay. RETRY is very similar to the infamous Flappy Bird in game mechanics, having the same “Tap to fly” controls that most iPhone gamers are used to in newer games. Though RETRY is a new game, it has side scrolling pixelated graphics, drawing more similarities to Flappy Bird. The whole object of the game is to dodge items. However, this time, instead of dodging pipes, the user is avoiding the ground, rocks, and even the clouds! The law of physics are the only thing that can save you during gameplay. Throughout the levels, gamers inhabit a plane with very limited range of motion. Even though this game is very similar to other games on the market, it takes the frustration and addictive gameplay to a whole new level. Level 11, that is, specifically Rovio Level11. This hot new game has brought the creators of the hit game Angry Birds a glorious comeback. This game is named after what users do multiple times per level: retry. 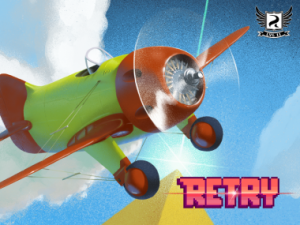 The app offers different stages that players can unlock, which is one of the beloved aspects of the app that distinguishes RETRY from many other retro-style games. After completing a level that comes easy, the levels get harder, and harder, until users finally throw their phones in a “rage quit” and then pick up their newly cracked phones in another attempt to defeat the level. Instead of rating players on their high scores, this game rates on a basis of far you have made it in the game. In other words, instead of saying, “I have a high score of 83,” players can compare skill by saying, “I?ve passed level 27.” This follows the style of the top grossing game, Octagon. Nearly any player can come to love this game. It provides entertaining gameplay, as well as old-fashioned pixelated graphics and simple gameplay mechanics. Critics appreciate how the airplane isn’t limited to an up and down motion, but also does loops and can even fly backwards. The game goes so far as to tie in water mechanics and moving obstacles. The individual levels also change themes, including everything from a fossil excavation site to bodies of water to castles. Best of all, it?s free! For more featured apps, check out Featured App: goREACT, Molecules, VSB chemistry. Follow the Feather via Twitter and Instagram; @thefeather and @thefeatheronline. This writer can be reached via Instagram: @Jareds_the_name. 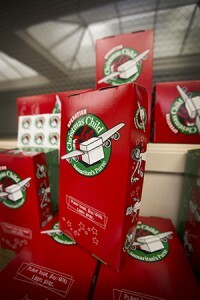 For more features, read the Dec. 1 article, Santa’s elves return to the North Pole with Operation Santa. World Kindness Week is a week that encourages people to do at least one random act of kindness during the week, including buying a Operation Christmas Child box. World Kindness Week is all next week (Nov. 9- Nov. 15). World Kindness Week is a week that encourages people to do at least one random act of kindness during the week. World Kindness Week is all next week (Nov. 9- Nov. 15). World Kindness Day was born when a collection of humanitarian groups came together on Nov. 13, 1997, and made a “Declaration of Kindness.” Likewise, on Kindness Day everyone is encouraged to make a similar declaration. Donating books, food or clothes to your local community is a great way to celebrate. However, pledging to commit just one act of kindness is no less worthwhile: hold the door open for a stranger, let your sibling have control of the TV remote for the evening. Val Rivera has already shown acts of kindness to Greg Stobbe and Robert Foshee by presenting them with a bouquet of flowers. A random act of kindness could be as simple as this, giving someone you appreciate a gift. Another way to participate in World Kindness Week is to be actively involved with a local serve project. This could include serving at an old folks’ home, packing medical supplies, feeding the homeless, donating to the church or charity, helping build houses for those who need it or even working in a soup kitchen. Being active in a local serve project is easier to keep up with than a normal act of kindness, even though both are completely acceptable. So rather than paying for someone else?s coffee, you could give the money you would have used to a charity or to your church or buy a meal for a homeless person. Some people already know what they want to do to contribute to others’ lives on World Kindness Day, including Kimberly Ward. Even though there are people who know about World Kindness Day and World Kindness Week like Ward, there are others that have no clue what this is. Stephen Walters, for example did not know what World Kindness Week is. Our goal this week at FC is to spread the word about this holiday, and encourage students to become actively involved in giving thanks and showing random acts of kindness. Help us spread the word by hashtagging related photos or tweets with #FCGiveThanks. Remember to give thanks this World Kindness Week, and spread the word about his holiday. In an attempt to get creative positive vibes going, the Huffington Post offers some Quotes to Inspire Kindness. Follow The Feather via Twitter and Instagram: @thefeather and @thefeatheronline. This writer can be reached via Twitter: @jareds_the_name. For more features, read the Nov. 13 article, Non-profit director organizes holiday boutique. October features many festivities here in the Central Valley, and with all of the options available, October is sure to be filled with both fun and spooks. Come to FC’s 30th annual homecoming on Friday Oct. 31 to experience floats, football and fun! There will be a color guard and percussion performance and a homemade float for each high school class. The FC jazz band will also be playing throughout the game. For these and many more, visit the FC football field this Friday, 7 – 10 p.m.
Good Company Players Presents The Addams Family, a frightfully delightful musical comedy about the original creepy, kooky, spooky family will run Sept. 18 to Nov. 9. It will show every night from 5:30 p.m. to 10:30 p.m.
Make a Wish Fundraiser at Jack’s Urban Eats invites families from the central valley to Jack’s Urban Eats in Fig Garden Village at 4 – 8 p.m., Oct. 28. If you present the special flyer at time of your purchase, 20 percent of your bill will be donated to Make-A-Wish Central California, found on Jack’s Urban Eats Facebook page. Back to Basics: Wilderness Skills at the John Muir Lodge is available to students from 10:00 a.m. to 10:45 a.m., Oct. 30. Spend 45 minutes buffing up map and compass skills, know how to read the weather, how to fit your own backpack, the best ways to use your trekking poles, and more. Each week the program will cover a topic from the “Back to Basics” clinics. Halloween at Hobb’s Grove ticketed attractions include The Hollows haunted forest, the haunted hayride into Shadow’s Keep and The Hobb Home haunted house. There’s music and characters milling around the several acres of land. The Halloween attraction is just outside of Sanger, only 20 minutes from Fresno. This event is going on every night from 6 p.m. to 10 p.m., Nov. 1. A Warnors Theater Presents a Silent Film of the Opera Showing Silent Film for the second annual showing of the original production. Attendees in Phantom of the Opera costumes will get in for free. Admission into the theater will cost $5. The doors will open at 6 p.m., as the show will begin, 7 p.m., Nov. 1. Planet Pumpkin is open with fair rides, pumpkins, a DJ on Friday and Saturday, and live music on Sunday evenings. They are open every day from 8:30 a.m.- 10 p.m. Admission is free, parking is free, and all rides are $1. We have pony rides for $5 and soon we will have the best face painters and pumpkin patch photographer in the Central Valley. Follow The Feather via Twitter: @thefeather. For more news, read the Oct. 27 article, STORIFY: Homecoming begins #FCgoesHollywood. Rick Alonzo, speed painter, martial artist and preacher shares his talent and the gospel like no other. Alonzo can easily paint a gorgeous masterpiece in 2-5 minutes. Most of his works are used in sermons and performances to spread the gospel, raise money for organizations, support charities and even inspire young children to stay away from drugs and alcohol. During a men’s retreat at Northpointe Community Church, Alonzo painted four paintings, Sept. 26. These include a painting of Bruce Lee, explaining his love for martial arts, and to teach others about what he calls “Christian Martial Arts”, which are used to defeat the Enemy. The second painting Is a painting of an audience member in the armor of God. The purpose of this was to show how one can use the armor of God to defend against the enemy. The third painting presented Jesus in a patriotic fashion. The purpose behind this piece was to show how we need God in America; a country that he believes is falling fast from the Lord. Finally, the last painting was of Jesus on the cross, portraying how he has already saved us from the punishment of death and how he is carrying us to an eternity of salvation. 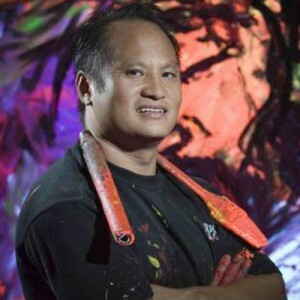 Alonzo started making his art to glorify God very early on in life, when he began to paint at the age of 4 years old. He then experienced a close encounter with God through an experience after a work day. Alonzo’s message included topics such as how to use the word of God and the armor of God to defend against evil unseen forces of the world. Alonzo went into detail with how our spiritual battles will affect our lives. He saw the hurt of his own kids and of the world, inspiring him to do a sermon on the topic of spiritual battle. Alonzo’s concern for his children’s problems at school leads him to make a message that tells us how to defeat the enemy. Alonzo reports that he truly wants everyone who is currently struggling with worldly problems to realize that we are fighting a spiritual battle rather than a physical one. The Bible describes this truth. Alonzo’s powerful message wasn’t only meant to reach older men, but also younger teenage boys. Alonzo believes that God loves each and every one of us, and that he has a plan for all of us. Alonzo wants the junior high and high school students who are reading this article to understand that God has a plan for them, and will never let them down. All of Alonzo?s stories can be found thespeedpainter.com and rickalonzo.com. For more features, read the Oct. 2 article, Multimedia position filled: Video Productions. 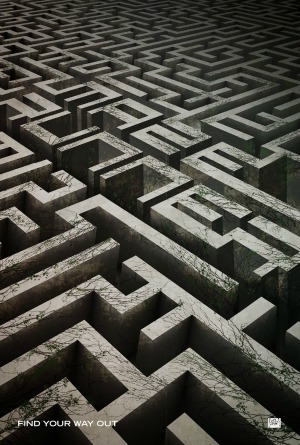 The Maze Runner, directed by Wes Ball, is an action packed thrill ride that provides a straightforward, more simple look at the original book. The movie combines drama, suspense, action, a little bit of comedy and sci-fi to make a movie that will satisfy all viewing groups. The one problem I experienced was how the events in the movie skip around quite a bit compared to the book. I have read the first and second book, The Maze Runner and The Scorch Trials. Anyone who has read the first book will realize that the events in the movie are out of order. If you are not expecting the movie to be completely accurate to the book, then your experience will be phenomenal. On the flip side, if you are expecting it to be exactly like the book, then you are in for quite an awkward time at the movies. If you are sensitive of spoilers, the next four paragraphs are spoiler heavy. Please skip to the eighth paragraph if you are not ready to hear the plot of the movie. The Maze Runner is a movie showcasing the life of Thomas (Dylan O’Brien) in a gigantic glade surrounded by the world’s biggest maze. Everybody in The Glade has had their memories wiped, leaving them only with their name. With a seemingly impossible puzzle, the “Gladers” face many problems. 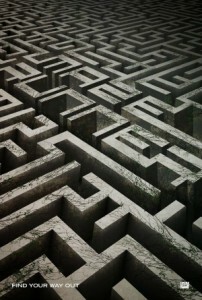 The maze moves every night, making it harder and harder to memorize. Although these problems seem quite prevalent, the biggest problem they face are the Greavers. The Greavers only come out at night, making them the reason that the maze runners go back to The Glade daily. Greavers are giant spider like monsters, with slimy bug like bodies and mechanical robotic arms, that sting their prey, infecting them with their poison. When someone is stung, they go through something called “The Changing”, which makes them lose their mind, but also receive memories of their past life, and visions as well. Thomas goes through the changing, and receives an injection that saves him, and the new found memories of his past life. He and the only female Glader, Teresa (Kaya Scodelario) are found out to be associated with the group of scientists called WCKD (or WICKED) who put the gladers in the place that they currently stood, as a test to study brain activity. The Gladers were also used by the scientist to develop a cure for the new sun flare caused disease, The Flare (further described in the second book, The Scorch Trials). Even though the movie is not completely book accurate, it does cover most of the book very well, just in a jumbled order. However, I personally understand where the director was coming from, because of the small amount of time that was received to make a long book into a two hour movie. If the audience would think of it in this way, it would be easier to see why the events are in a very different order than the book. The movie ends with Thomas and the Gladers escaping the maze, and completing the trials they were put on. Even though there is a second trial ahead of them, there is a great joy of escaping the almost impossible task. Overall, The movie, The Maze Runner is well worth watching if you aren’t expecting it to be exactly like the book (as most movies are not). I rate this movie four stars, for it is well put together for such a lack of time. The movie also has a spectacular soundtrack! The amount of action and special effects is phenomenal, and the drama and suspense are quite similar to that of the book, making it one of my personal favorite movies of 2014. The Maze Runner is rated P-13 for intense elements, thematic events and some sci-fi violence. With the college fair season already underway, two events are on the radar for students in the Fresno/Clovis area. With the college fair season already underway, two events are on the radar for students in the Fresno/Clovis area. The Buchanan and FC campuses will host college fairs to encourage students to narrow their collegiate options, Sept. 23. While the FC college fair started at lunch in the Ground Zero area, the Buchanan college fair is available after school hours for students who have further interest in any of the booths available on campus. The National Christian College Fair will occur from 6-8 p.m., featuring almost 30 colleges. The event will be in the Multipurpose Room at 1560 N. Minnewawa Ave in Clovis. The college fairs on both campuses offer students the opportunity to plan ahead for their post secondary school choices. 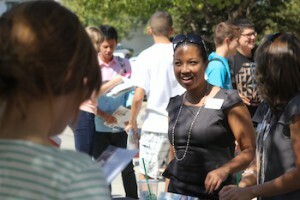 Annually, FC has hosted a college fair that all students attend. This year’s event will be Sept. 24. This event gives students a variety of options from a wide array of different colleges. This is a great opportunity for juniors and seniors to explore schools throughout CA and the western U.S., including technology schools. Many of the schools will provide information on scholarships and admission tips with applications. No matter a students’ grade level, this event is meant to move student choices along, promoting college career choices in high school. Academic Adviser Michelle Warkentin, who organizes FC’s college fair, shared how she believes this will help students make a wise decisions. Senior Gabriela Siqueiros is attending college fair on the FC campus. Even though she does not know which school she would like to attend, Siqueiros would like to see the different schools that are available so she can be prepared for the application process later in the year. As a new school year arrives, students are asked to bring laptops and tablets to class to use online textbooks. Students have recently been introduced to a new form of education: online textbooks. This system offers a number of different benefits, however, there have been a few complications. Starting this year many science, math and history classes have been introduced to online textbooks. Even though students have been relieved of carrying their textbooks, many have experienced frustration while trying to access the school wifi because of the firewall. Like other students, Roman Endicott, ’18, is taking classes requiring online textbooks. Endicott expressed his excitement about the new form textbooks. 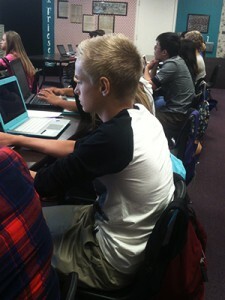 Many of the students were frustrated while opening up their online textbooks for the first time. Joshua Oakley,’18, further describes the specific problems. Reporter, Leslie Mann of The Chicago Tribune, also talks about the pros and cons of this new form of technological education. Mann states that even though test scores between students that read online textbooks and students that read print textbooks were the same, this system gave many students eye strain. The other cons Mann stated were cost, technological problems, low battery life and even nausea. As of Aug. 21, a new firewall has been up and running, making things much faster. IT Director, David Martens describes how the problems were solved. Katie Jacobson son, ’17, describes her new experience with the firewall, and enjoys the easy access of the new system. Classmates can access these textbooks via websites, PDF files and Schoology. Schoology offers students access to homework, videos, pictures, documents and many other files shared by teachers on the internet. Head of Science Department, Dr. Karen Walters shares the online textbooks through Schoology. Walters shares why she believes this system will work for the benefit of both students and teachers. Follow The Feather via Twitter: @thefeather. This writer can be reached @jareds_the_name. Students line up to begin taking their pictures from Milne Photography during picture day. The horrors of picture day are a distant memory. Student anxieties included forgetting to wear picture worthy clothes, blemishes or zits, disheveled hair, shirts not being centered, food in their teeth, stained clothes and more. 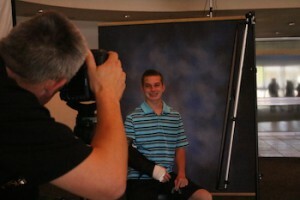 Campus freshman all have different fashion styles, and noticeably show them off during their first high school pictures. Student Stephen Walters, ’18, explains his own fashion preferences. Some students like to dress their best, like Walters. On the other hand, some students prefer to dress casually such as Tyler Villines, ’18. Carlee Whipple, ’18, likes to wear nice clothes, just as Walters did. Many freshman seem confident with what they wear to picture day, but freshmen face their biggest fears when going into high school. A school wide freshmen poll asked students to check each box that applied to the fears they had for the new year. The results are as follows. Upperclassmen with seven, getting trampled in the hallways with seven, fitting in/acceptance with 12, new classes/ schedule with 12, higher expectations from authority with 20, failing grades with 28, not making friends with seven, finding a group to sit with at lunch with two and the clothes you wear with seven. The results showed that the biggest freshman fears out of 35 students were failing grades in first with 28 out of 35 students, higher expectations from authority in second with 20, fitting in/ acceptance and new classes/schedule tying in third with 12. Though a poll can point out some specific fears of the students, there are many more still to be shared. Villines stated his fears. Although there are many fears that freshman carry, they also seem to be excited about the new school year, as Villines stated. History Teacher, Kori Friesen, having taught Freshmen classes, knows some of the biggest freshmen fears, but also sees a new difference in this year?s freshmen. This writer can be reached via Twitter: @jareds_the_name. For more features, read the Aug. 19 article, Back to School Night showcases parents to classes, teachers.